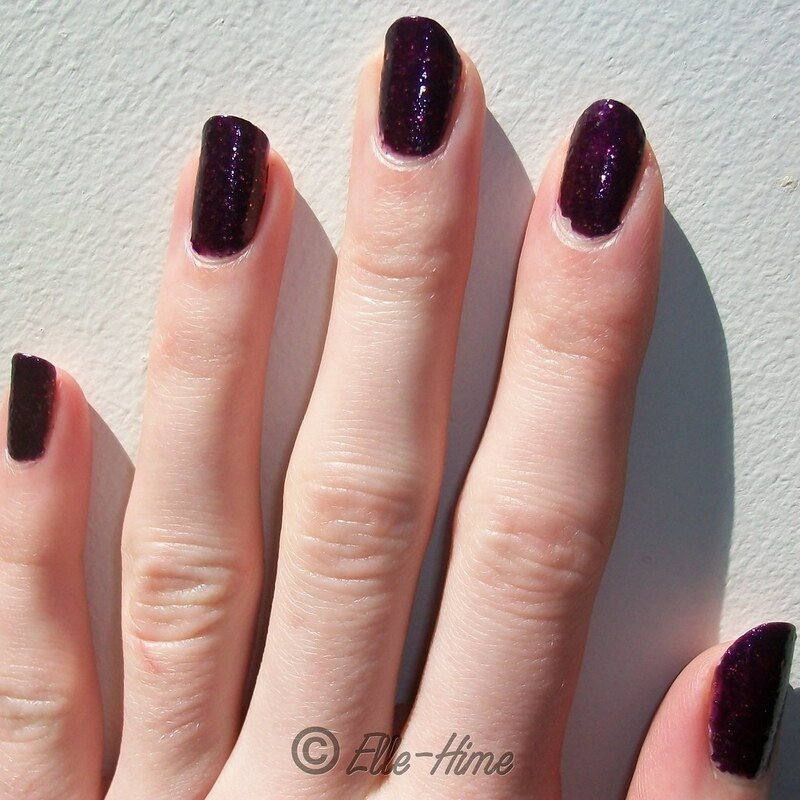 Princessly Polished: Swatches: Glitrix nail polish in Royal Chic! Today I have an extra-special polish to share! 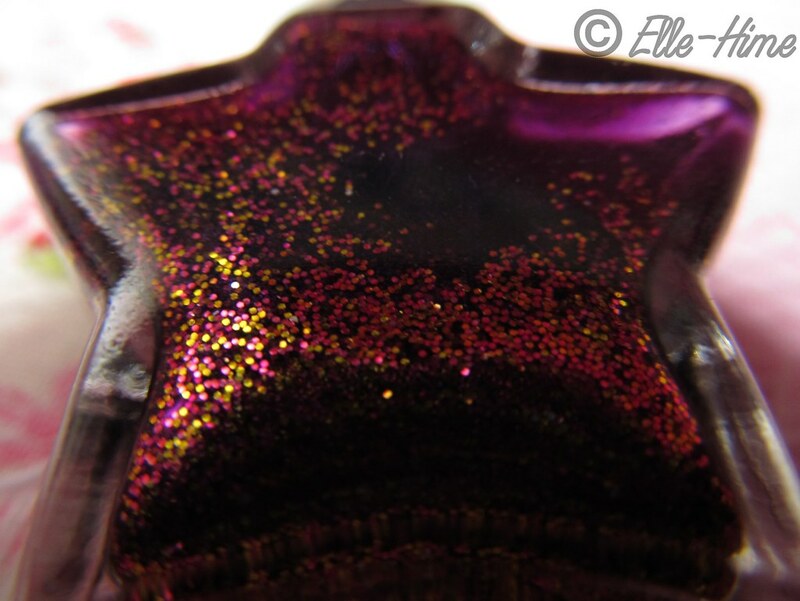 This is a franken polish done by Glitrix on etsy! I just looove etsy... and I especially love it right now because it helped me connect with the sweet girl in Singapore who is behind these polishes! She sent me two colors from her shop, and I've already worn both and have been pleased. First up let's take a look at Royal Chic! Your eyes aren't deceiving you - that is a star-shaped bottle! 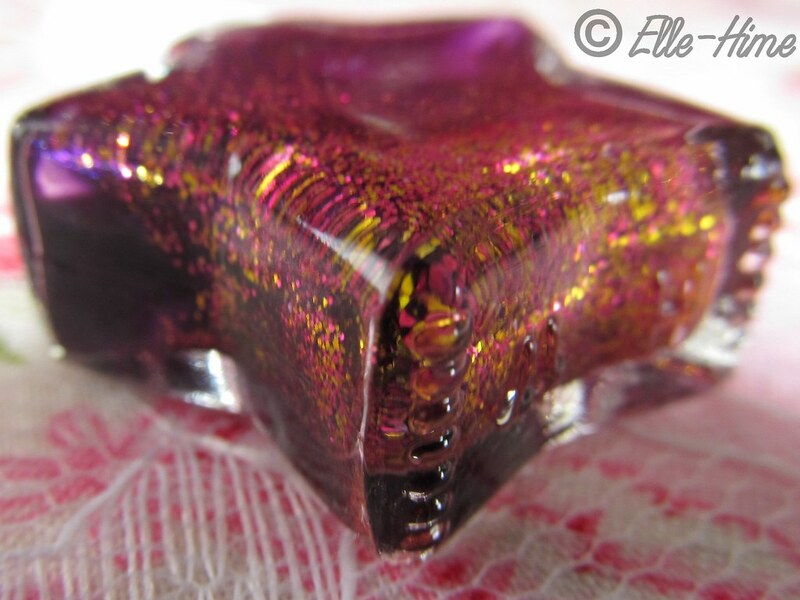 Glitrix polishes come in adorable mini-sized star bottles that set them apart from the pack. The brush head is surprisingly full (almost too much for my tiny nails), and the handle is easy to grasp. Here is a nail wheel swatch of one coat and then two coats. 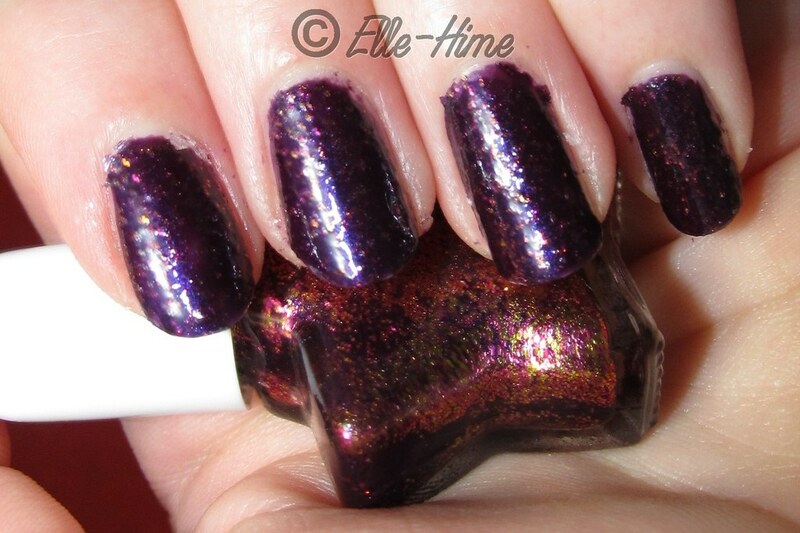 You can see the shimmer here and it shows what a rich color Royal Chic has. My experience with this polish is as follows! In the bottle the glitter in this polish settles quite a bit. There is a metal BB in the bottle to help with shaking the polish up. Rather than shaking it so much I found it was easiest to simply lay the bottle on it's side and flip it over every couple of minutes while I'm applying base coat. Then set it right side up after giving it a quick shake, and ta-da, it's good to go. As you can see there is a lot of glitter in this polish and I didn't have any trouble with coverage! In consistency it sort of reminded me of grape jelly - it's a bit thick from all the glitter, and isn't smooth when it dries. Nothing terrible, though, and could be smoothed out with a thick top coat. Because it wasn't gritty I didn't mind the texture at all. This starts to dry very quickly, which is nice but made it next to impossible to wrap the tips of my manicure. I'd suggest using a similar-colored polish for that step - glitters are generally not a good choice for wrapping the tips of a manicure! This isn't extremely glossy on it's own, but has a unique textured shine and the shimmer is very pretty. Gold is generally not good on me but the glitter in this polish actually works for me! I think the highly pigmented base helps tone down the color. 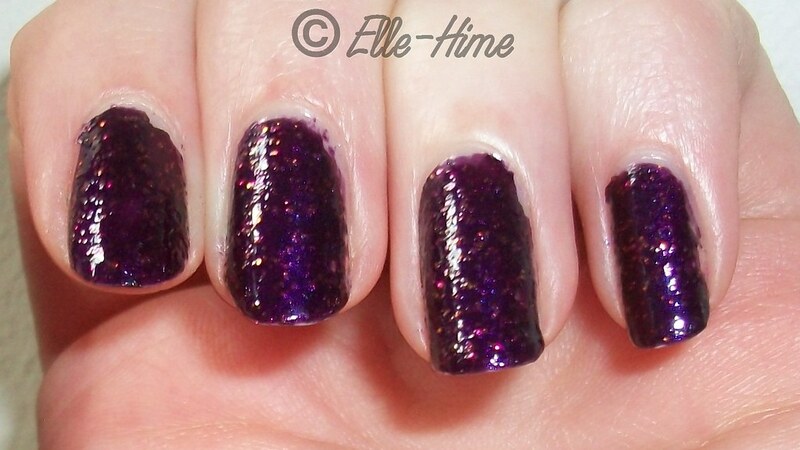 I really liked wearing this polish and the color definitely did feel royal! This isn't a color I would reach for in a full-sized bottle, but getting a mini opened my nails up to new possibilities. Royal Chic was nice and durable, I didn't have issues with chipping, just a bit of tip wear because I work with my hands so much. When it was finally time to take it off the glitters were a little stubborn, but finally let go when they realized I meant business. =P Another thing I really liked was how cleanly the deep purple came off. Ever have a polish smear all over your fingers and stick to/stain your skin? This one wiped off cleanly. 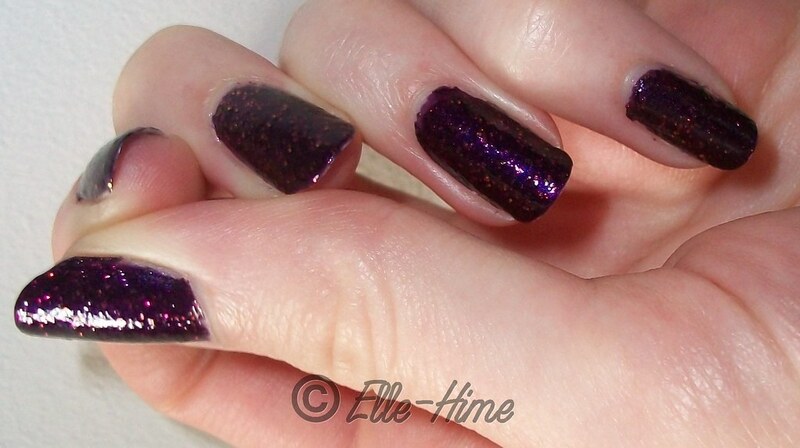 In summary Royal Chic is a really neat polish that is worth the extra bit of effort to apply. I was impressed with the pigmentation, the density of glitter, and how good it looked on me! ;D Because Glitrix polishes are mixed from other polishes they may or may not be entirely Big 3 Free, but they've played nicely with my other polishes, so I'm thinking they are. The mini bottles are affordable and adorable. I see these as being fun to collect, share... and wear!